THE EXACT FORMULA I USED TO GROW MY EMAIL LIST TO OVER 30,000 USING PINTEREST! What if 30,000 people let you inside their inbox? 30,000 opportunities to turn a Pinterest visitor into a loyal customer instead of losing them to a 30-second page view. You've heard Pinterest is an amazing source of traffic for brands and bloggers, but you just don't get it. You've spent hours searching Pinterest for Pinterest strategies. But it seems everyone has a different opinion on how to drive traffic to your website using Pinterest. You have so many questions and no clear answers. Should I use a Pinterest scheduling tool? Do group boards still matter? What the heck are group boards?! How do I get on "good" group boards? What should my profile look like? How many pins do I pin per day? What do you mean Pinterest isn't a social media platform? How do I find relevant keywords? Where do I put those keywords? Email list? Why do I care about my email list?! I thought we were talking about Pinterest?? ...ugh, I know, it sounds complicated, doesn't it?! Monica breaks it down in a simple and easy way. She allows you to see how to leverage Pinterest for your business. This is a must have course if your business deals in how-to content, course work or visuals. There is only one secret to driving traffic to your website from Pinterest... keywords! You're going to learn exactly how to bring Pinterest traffic to your website using keywords and what to do with your customers once they arrive at your website! TARGETED KEYWORDS DRIVE ENGAGED TRAFFIC. Funnels are your secret sauce to convert Pinterest traffic into email subscribers. Why should you care about email subscribers? Because email allows you to turn Pinterest browsers into paying customers! YOU DON'T NEED A TON OF TRAFFIC. YOU NEED TARGETED TRAFFIC. Before I took Monica's course, I didn't have a real Pinterest strategy. I was just pinning inconsistently from my blog and repinning sporadically when I saw something my audience might like. I loved Pin Practical because it's super concise and is a very short time showed me how to drive targeted traffic and to get those click throughs onto my email list, which is what I really need to focus on. Monica's course Pin Practical is a great Pinterest course. It helped me build a Pinterest strategy that works! I am slowly and steadily growing my Pinterest following and I get about 90% of my blog traffic from Pinterest. I recommend this course to anyone that needs help understanding how to use Pinterest to grow their traffic and email list. Updated for the latest Pinterest marketing strategies for 2019. How Do You Know if Have Rich Pins? Does Pinterest Know What Your Pin is About? What the Heck is a Fresh Pin? The Million Dollar Question: How Many Pins Should You Pin Per Day? What is Manual Pinning and Should I Do It? Thanks to Monica's Pin Practical course, I now have a great Pinterest strategy. I have taken other Pinterest courses but Monica's is easy to follow and quickly put into practice. The best part is it only take a few minutes a week to manage my new strategy. As a business owner who caters to busy working moms, I've known that Pinterest is a great place to reach potential customers and others in my target audience. But the technology and understanding the pinning strategy on Pinterest kept me from going anywhere near that platform for business purposes for almost 2 years! When I came across Monica's Pin Practical training, I thought it was a great time to see if I could finally figure it out. Within just a couple of days, I was loving Pinterest! I had a keyword-rich Profile that would attract the right people (it was organized and pretty too!). I had a Tailwind account up and running, and had several weeks worth of pins scheduled out and ready to go. I had created nearly 30 pins for my own content, which had previously just been sitting un-viewed on my website. And now I have an automated process for attracting people to my opt-ins on a regular basis, so my email subscriber list has grown steadily since I started using Pinterest. I have an active Pinterest account, is Pin Practical Masterclass worth my investment? Absolutely! Many business owners have active Pinterest accounts, but that's only half the equation. Pin Practical Masterclass not only teaches you a low-maintenance strategy for maintaining your Pinterest account, it also teaches you how to turn your Pinterest traffic into email subscribers and hopefully paying customers. How do I access the Pin Practical Masterclass course? Great question! Pin Practical Masterclass is hosted on the Thinkific course platform. When you checkout via a secure connection with Thinkific, you will be prompted to create a username and password. After you create your username and password, you'll be sent to a secure checkout form where you can use any major credit card or PayPal for payment. What if I don't know anything about Pinterest, will this help me? Yes! I cover the basics of Pinterest for Business in the first and second modules. The focus of Pin Practical Masterclass is on creating an easy-to-implement strategy that is low maintenance and produces a high return on investment for the time you spend implementing the Pin Practical Masterclass strategies. You'll have access to Pin Practical Masterclass for as long as the course exists. Including all updates to the core curriculum. This does not include guaranteed access to future bonuses. Please read our terms and conditions for more information. I am confident Pin Practical Masterclass can work for you. With our happiness guarantee, you can purchase risk-free. If you watch the course videos and complete the workbook assignments and still don't feel like it's a fit for you, you can request a refund. For complete details on our happiness guarantee, including the refund timeframe, please refer to our terms and conditions. Advanced strategies for growing your Pinterest presence, building your email list with Pinterest, and creating loyal customers! My biggest takeaway from this course was how important your keywords are. I am very interested to do some research and find out what keywords will help me build up my profile! My pinterest is not very strong and I thought this would be a great opportunity to help me improve. I love that you showed us exactly what we would see on the screen. I feel like other programs just tell you what it should look like. This course was very easy to follow and understand. I would recommend it to a friend! My biggest takeaway from this course was the keyword research and how to implement those into descriptions. She supplied spreadsheets of niche group boards and how to contact them. This was the bomb and made it super easy to implement. (I've only done 1 so far, but will be referring to this spreadsheet in the future. Thank you!) This course is practical and easy to follow along and I would recommend it to a friend! My biggest takeaway from this course was using Canva to create wonderful pins, I would have never thought of that! With practice it will become easier and easier. When I saw this course I wanted it right away, I love Pinterest so once I saw the opportunity to learn about it I jumped right in. The course is very very original and informative. I would recommend it to a friend! The biggest takeaway was that I had only been using maybe 1% of all the Tailwind features! I can't believe how easy it is to find, select and schedule large numbers of pins! This course has excellent, easy to follow videos! It’s a great foundational course and I would recommend it to a friend. 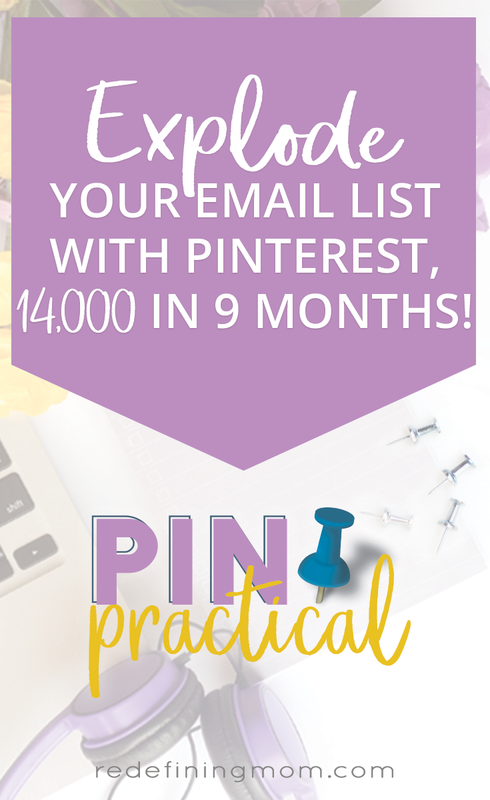 Pin Practical gave me just the instruction I needed to hit the ground running with Pinterest. The course demystified the world of Pinterest and broke everything down into easy and actionable chunks. It's a resource I can return to again and again!